Various executives, including Audi Canada President Daniel Weissland, second from left, and Bramgate Automotive Inc. President Bill Johnston, third from right, were on hand for a groundbreaking ceremony in Brampton, Ontario. Despite the diesel engine emissions scandal that has afflicted sister brand Volkswagen, Audi is doing well in Canada. Audi sales were up 16.0 per cent through June this year, outperforming its German and Japanese luxury-brand peers, though not Volvo and Jaguar Land Rover. And it is against this backdrop that Audi Canada will have a new dealership in Brampton, Ontario, by this time next year. 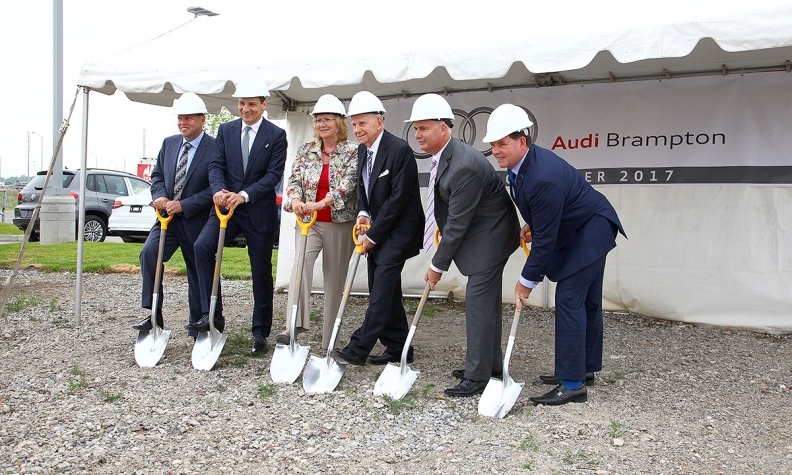 Bramgate Automotive Inc. staged a ceremonial ground-breaking July 8 at Audi Brampton’s future location on the northern outskirts of the GTA bedroom community. The three-storey, 5,574 square metre facility will be built alongside Bramgate’s Volkswagen dealership at a new luxury auto mall on a green-field site. Bramgate VW moved to the site last fall from its former location near downtown Brampton. The Bramgate group also owns Audi of Mississauga about 22 km away in Brampton’s sister city. Audi Canada currently has 45 stores in Canada, and that “will increase to 48 by mid-2017 with projects under way currently,” said Steven Smith, Director, Network Development and Training for Audi Canada. Audi of Brampton will neighbour Policaro BMW, Mercedes-Benz Brampton and a new Infiniti dealership currently under construction at the mall. The site is positioned between the ever-expanding Brampton/Bramalea metropolitan area to the south and a “mink and manure” belt of upscale country homes and farmland to the north. Zanchin Automotive Group, which owns 28 dealerships around the GTA, is developing the auto mall and owns the Infiniti shop being built there. Bramgate is a family business founded in 1967 by Bill Johnston Sr. His sons Bill Jr. and Brad are general managers of Bramgate Volkswagen and Audi of Mississauga respectively. The group still owns the former Volkswagen location on Queen St. in Brampton that houses a pre-owned Centre and a collision centre. The main floor will comprise the traditional dealer setup: new-car showroom, service reception, workshop and parts. A state-of-the-art customer privacy lounge will feature a large interactive display where customers can “build and price” any Audi while their vehicle is being serviced. The second floor will house administration, meeting rooms, staff kitchen, change rooms as well as additional parts storage. On the third floor will be a second showroom, highlighted by a four-car display behind a large window overlooking the 410 highway. In total, there will be indoor showroom space for more than 40 vehicles.